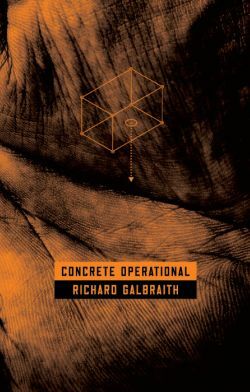 Concrete Operational is my novel; it’s an independent release funded by the Arts Council England. That statement itself raises two quick questions: why indie, and how did you convince the English Arts Council to give you thousands of pounds to publish it? Well, this is where my journey into independent publishing, collaborative media, design, filmmaking, music production, art manufacturing and a host of other things came to being. Let’s take a step back to 2009, I had my novel manuscript complete, and I’d had it assessed by the most excellent Oxford Editors. My assessor said that whilst it was a good manuscript, it was difficult in places and would have problems finding an agent or a publisher because of its content – at the time, the second chapter was a 4,000 word speech, for instance. I looked back on my manuscript and remembered that the reason I began writing it wasn’t to get published, but to explore my theories and beliefs about the human condition and Fatalism. To an extent, it had done that. I also knew, however, that I would like people to read it, and that the 80,000 words that I had written were a jumbled mess of vast streams of consciousness and surrealist writing. I decided to compromise: I would make the novel – the manuscript that ‘had legs’ – legible. I’d do everything I could to make it a compelling, insightful and interesting read and tell a real story, but I also wanted to keep that keen look at humanity. I wanted to make sure the reader came away with something, and so I decided on a collaborative media project because, well, I’m not Kurt Vonnegut. I pooled my resources and crowdsourced five British bands and five British artists who were prepared to create original music and art around five emotionally driven extracts of my novel. The promise was an art book, music album and novel, all to be released at the same time through the Amazon print on demand service, Createspace. We would have a launch night, a seven-day exhibition and the support of marketing and promotion professionals. And that is what Operation Concrete came to be. Only we achieved so much more along the road: we produced a 72 page art book; a five track album; a six minute short film; original designs and branding around all assets; 200 bespoke, hand-made boxes for ‘box-sets’ of all the products. The launch night had well over 200 attendees, and the seven day art exhibition (which was free to the public and ran in London) saw over 1000 patrons pass through. The exhibition was an immersive experience that allowed the patron to read the extract, see the art and listen to the music all at the same time. It was all a great success. However, all in all, it’s been a very difficult road. Pulling it all together was hard, but trying to get people to find out what we did and understand what it was and is all about is proving to be the most difficult part. Hopefully this post has sparked your interest, though, so head over to Operation Concrete for samples of the art, music and words, to view the short film, and ultimately to purchase any of the items – or even all of them as one of the box-sets. I hope you enjoy it, and I hope that through it you can discover something about yourself that you might not have know was there before.